According to Android Authority, among the many glorious ingredients that are baked into the Pie belonging to Android 9 is a security feature known as Lockdown mode. With the latter enabled, an Android Pie user won't have to worry about personal data being stolen while some stranger is holding on to his phone. Under Lockdown mode, a phone's facial recognition system is disabled as is the device's fingerprint scanner, and any other method setup for unlocking the handset. The Android 9 Lockdown mode also blocks notifications from appearing on the device's lock screen. 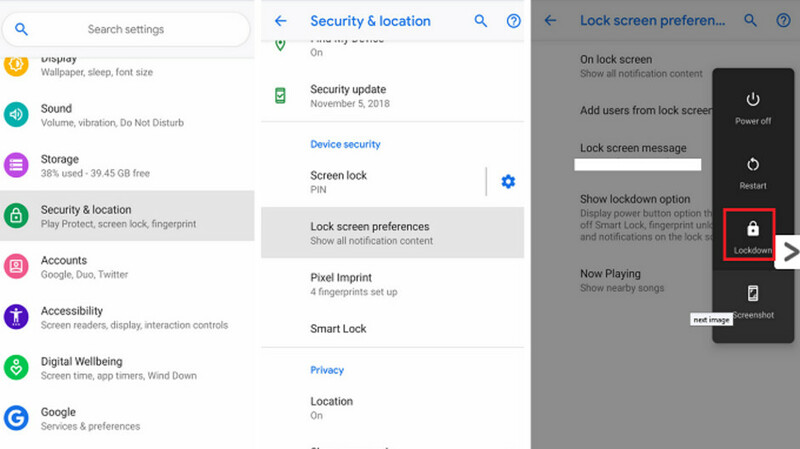 Those looking to prevent law enforcement from opening their Android phones running the latest build of Android, can use the Lockdown mode as a way to block the G men from gathering personal data from such handsets. It also comes in handy during times when you need to turn over your smartphone for a few minutes, such as on the security line at the airport, or when you're having a Xray, CT Scan or MRI done and you need to give your device to a nurse to hold. To enable the Lockdown mode on your Pie powered Android phone, go to Settings > Security & Location. Tap on Lock Screen Preferences and toggle the Show Lockdown Option to "on"). Once you have done that, you can turn on Lockdown mode by pressing down on the power button. This will reveal a new option listed above the screenshot icon. Tapping this Lockdown icon will immediately lock the phone and stop lockscreen notifications from appearing. Disabling Lockdown mode simply requires the user to enter his PIN, tap his pattern on the screen, or enter his password. Because Lockdown mode can't be easily toggled on using Quick Settings, users will have to turn it on every time they want to use it. It's a nice feature where apps can stay running. Can also just long press power button until phone reboots an locks out facial and finger print access until pin or pattern is entered too in a pinch.